The Duck Fight, Tascosa, Texas and Boothill Cemetery. It started over a duck. Caleb Berg (Cape) Willingham, first sheriff of newly-organized Oldham County, was in the Equity Bar, Tascosa’s oldest saloon, when he heard a commotion outside. Suddenly one of the town’s few ladies did something most ladies of the era would not – she ran into the drinking establishment. Willingham saw that the woman was referring to Fred Leigh, foreman on the LS Ranch. Leigh was known for his drinking and had been warned before about carrying a pistol in town. Armed with a double-barreled shotgun, the big sheriff walked out and approached the cowboy to discuss the fair market value of domesticated migratory waterfowl. “Hell, no, I ain’t going to pay for no duck,” the cowboy replied. Willingham was in the process of reminding the cowboy that he was sheriff when he saw the drover’s hand moving toward the six-shooter on his hip. That ended the talking. The sheriff let loose with both barrels of his scattergun. With 18 pieces of buckshot in his body, the cowboy tumbled from his horse, as dead as the duck he’d blasted a short time before. Willingham went on to serve out his term as sheriff, but in 1882 he was defeated in his bid for another two years in office. After losing the election, Willingham moved east across the Panhandle to Wheeler County, where he operated a saloon in Mobeetie. Later, he became manager of the Turkey Track Ranch. In McCarthy’s version, the woman who owned the duck was pregnant. She fainted after seeing Leigh shoot off the bird’s head. McCarthy also listed Leigh as the second occupant of Boothill, not the first. But both authors agreed that it all started over a duck. Hunter said the shooting happened in 1879, but Willingham had not become sheriff until 1880. McCarthy did not offer a date in his book. No matter exactly when Leigh died, or whether he was permanent guest No. 1 or No. 2, Boothill Cemetery went on to accommodate a total of 32 graves. Twenty-three of the occupants were men who, like Leigh, died with their boots on. Tascosa, like most of the people in its cemetery, did not live to enjoy old age. When the Fort Worth and Denver Railroad cut across the Panhandle, the tracks did not come to Tascosa. The once lively – and deadly – cowtown faded away as the nearby railroad town of Amarillo grew. In 1893, a flood on the Canadian River destroyed the bridge leading into town as well as many buildings. That was the last straw for Tascosa, which soon lost its county seat status to Vega. 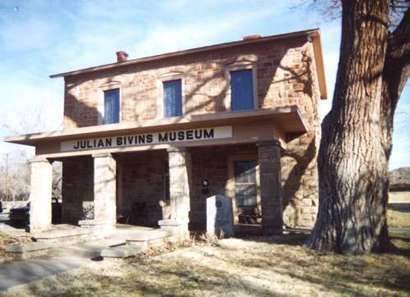 The same year, Willingham left the Panhandle for New Mexico. He ran a ranch near Roswell, before continuing west to Arizona. He died there in 1925 at the age of 72. 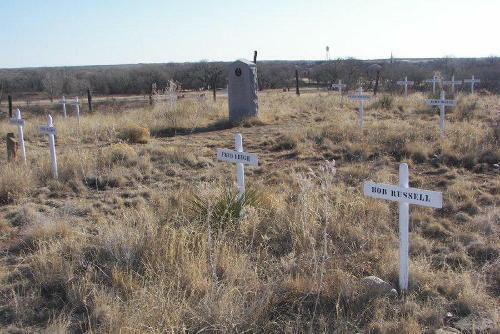 Today, all that remains of old Tascosa – now the home of Cal Farley’s Boys Ranch – is the rock building that once served as courthouse and a hill-top collection of lonely graves. Tascosa, now the site of Cal Farley’s Boys Ranch northwest of Amarillo, had the reputation of being one of the toughest towns in Texas during its heyday in the early 1880s.